Be sure to read our frequently asked questions page for more information on how the Heli-Chair works and what it can do for you! $45.00 Build your own Heli-Chair with our Plans! You can build your own Heli-Chair and have fun doing it. See our plans and kits page for more information. It's a big project but there are places to cut corners if you're so inclided. Since we aren't selling kits or pre-built anymore, this is your only way to get flying. Just-add-pilot, turnkey package! You're ready to fly. This bundle package is taylored to future helicopter pilots. Upon shipment to your doorstep, you can be flying in just a few hours. 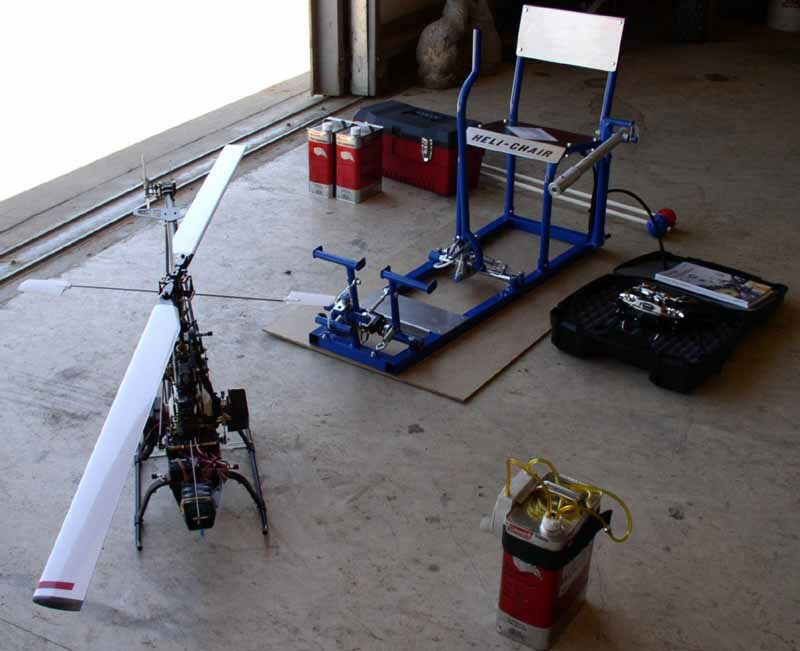 Everything but fuel and a 12 volt battery is included and the helicopter if flight tested before shipping. Fuel can be drop shipped from our supplier or purchased by you locally to avoid excess hazardous material shipping fees. Most people will use their vehicle as the 12 volt battery, if you prefer another method, let us know and we will make sure you have what you need to fly. Pakcage includes: Heli-Chair 5-channel basic flight console, modified Futaba 7CHP radio, Thunder Tiger Raptor helicopter assembled and ready to fly, Rotopod training gear, pilot logbook, hobbs meter upgrade for Heli-Chair (for logging training time), FAA basic rotorcraft handbook, Heli-Chair flight training video and field gear necessary for starting and flying your helicopter. Upon arrival at your doorstep, the included video will teach you how to re-assemble the unit (taken apart for shipping purposes) and have you flying as soon as possible! The entire unit is flight tested before leaving our factory so you know everything will be set up properly when you receive it. Convert-A-Mosquito This package includes drawings, parts and a pre-modified Futaba radio (the drawings are not yet specific to the Mosquito, but will soon be updated). 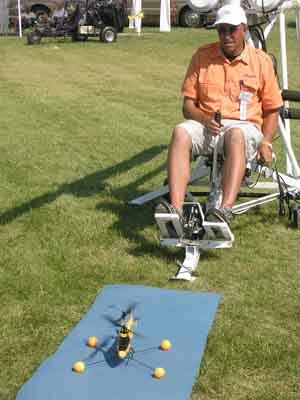 With a little work, you'll soon be learning how to hover using the control system on your Mosquito helicopter. When you're ready, you simply shed your earthly shackles and fly away in your Mosquito ultralight helicopter. This method of learning by far exceeds what you can learn with a flight simulator, and let's face it, with an ultralight helicopter you're not required to get flight instruction. It's up to you to be responsible enough to know your limits. If you absolutely do not want professional training, then this might be the next best alternative. Read more about the Mosquito/Heli-Chair here. "Walk away hovering", 2 days, 12 hours total time on the Heli-Chair If you can travel to our facility and spend two days with us, we'll send you away in a hover. With the skills you learn, when you go to your flight school, you're going to be starting out where most people end up after at least 10 hours of instruction (at an average of $220/hour). The idea is to teach you the gross motor skills and basic coordination you'll need to fly. For any current and proficient fixed wing pilot, our course is guaranteed. For the complete rookie, we can only promise to do our best as learning styles and baseline knowledge will vary widely between students. Review the course curriculum here. Cyclic Grip Upgrade This upgrade increases functionality by bringing more of the switches from the radio right to your fingertips. It is expensive because it's lots of extra parts (the grip itself is $175) and a lot of extra wiring. We'll add some wires to the radio to hook directly to the switches. We can configure the cyclic grip however you want and there will always be the option of changing some of the assignments in the future. We don't recommend this for the basic customers who only want to learn to hover. Basic Heli-Chair Unit without the goodies. 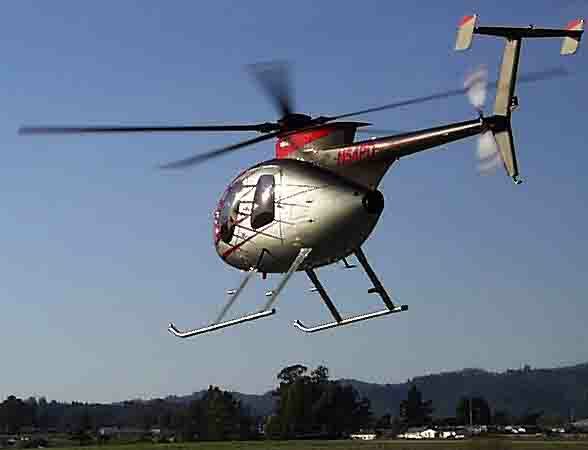 The most inexpensive Heli-Chair package is the "Basic Heli-Chair Unit". You will be required to supply us with your radio transmitter, which will be modified to interface with the Heli-Chair. Your radio will NOT be tied exclusively to the Heli-Chair. You will be free to use it, any time you choose, in the exact same way that you use it now. Note that you will have to build your own helicopter and acquire the necessary field gear to keep it operating. This option is recommended for persons already involved in model helicopters. Note, the basic package does not include paint! 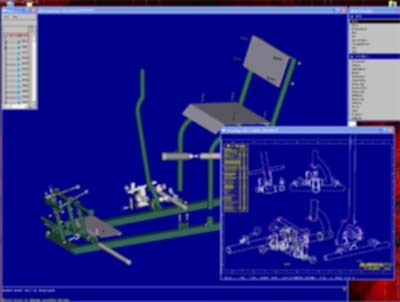 Bare frame Heli-Chair weldment package. This is a tentative product offering we are experimenting with. Provide the interest is strong enough in this option, we will build a batch of bare Heli-Chair frames that are ready to wire. You take the frame, paint it your own custom color, complete the final assembly and then wire it up! Please take note that these frames are not yet available and that we are offering the concept on our product page to see if there is sufficient interest to take it further. Analog USB interface for prototype designs, $225 With this device, you can interface just about anything that creates an analog voltage signal. You can even order one of these to plug into your Heli-Chair and then work directly with any flight simulator available today! Has 7 analog inputs and more than 10 button inputs. International Shipping Surcharge- We will charge you for the actual shipping cost for domestic shipping (the United States). International shipments will cost $100 in addition to the carrier fees. This fee does NOT apply to plans and DVD's, which can be easily sent through the US Postal Service or by priority shipment as "documents".